The curriculum at Badgerbrook is delivered through three key stages; Foundation, Key Stage 1 and Key Stage 2. A new curriculum was introduced in 2014. Please see the Curriculum Plan page for more details of the areas covered in each year group. Listed below, for each year group at Badgerbrook Primary School, are a number of example tasks and activities that may be given as homework. This is not an exhaustive list and is open to change, although many of these tasks and activities will be used on a regular basis. Homework activities will change to meet the needs of the pupils involved and activities that might be occurring in class. All homework will have a clear purpose and assist pupils in the process of their development. From early in the Autumn Term Foundation Stage children will be expected to practise phonics and letter formation from Read, Write, Inc. for 10 minutes daily. Children will be encouraged to borrow books to share with adults at home. During the Autumn term children will be given a reading book to share and will be expected to read with an adult at home at least 3 times a week for 10 minutes each session. Homework books will be used from the Spring Term with fortnightly practical topic-related activities. The expectation is that these should take approximately 20 minutes to complete. From the beginning of the Autumn Term Year 1 children will take home a reading book and a reading diary. The children will be expected to read to an adult at least 3 times a week for 10 minutes each session. A written or practical task linked to topic or science work will be given fortnightly. The expectation is that this should take approximately 30 minutes to complete. In addition to this, we use the back of the homework book to put English or Maths tasks or information that is relevant to their current learning. Homework books will be used for homework tasks. Children will be expected to read to an adult at least 3 times a week for 10 minutes. The children will be expected to practise and complete spelling sheets weekly. A Topic or Maths task linked to the current topic will usually be given weekly. This may be a practical or written task. The expectation is that this should take approximately 30 minutes to complete. Children will be expected to read to an adult at least 3 times a week for 10 minutes each session. Children will be expected to practise spellings through activity sheets or specified tasks. Children will be expected to practise times tables and associated division facts at least 3 times a week for 10 minutes each session. This will be followed up in school with songs/games. A weekly arithmetic sheet will also be sent home. Homework linked to the year group topics will be given periodically. Children will be expected to read to an adult at least 3 times a week for 10-15 minutes each session with comments verified with an adult’s initials. Children will be given a spelling list every 4 weeks and a related activity to complete weekly. At the end of the 4 weeks a test will take place in school, to assess children on some of those spelling words. Children will be given a multiplication focus. They will be encouraged to practise these at home throughout the week. This will be an on-line or paper activity. There will usually be a weekly arithmetic sheet. Guidance and links to suggested activities will be provided to parents/carers. Further formative practise tests will be carried out in school time on a weekly basis. Independent research linked to the year group topics will be sent home throughout the year. Children will be expected to read at home 3 times each week for approximately 15 minutes per session, recording this in their Home/School Diary. Spelling patterns and homework will be sent home each week in order to prepare for a 4 weekly spelling test (focussed on the spelling patterns practised in each set). Children will be expected to complete a weekly arithmetic homework. Reading – It is suggested that the children read a minimum of 3 times each week for approximately 15 minutes per session, discussing this with an adult and recording this in their home/school diary. Spelling – Units of work for spelling last 4-6 weeks. Children will bring home a list of words to work on at the start of the unit and be tested on these spelling patterns at the end. Maths – Generally Maths homework will be given on a weekly basis. It will relate to a) the current area of learning b) a previous unit of work c) general arithmetic skills. The aim of our homework is to support and consolidate work in class. Follow the links below for some suggestions for books for your child to read at home based on Year groups in school. We hope you will find the lists useful when you are in a library, browsing in a book shop/charity shop or looking on ebay! We also have copies of a selection of the books in classrooms. Most, but not all, are available from the school library. 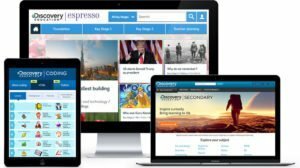 Click here to access the Espresso website.